2011 July Update: UFO entities' hidden agenda for planet Earth finally revealed! Hidden in some UFO communications a message has been found that reveals their true hidden agenda for planet Earth! UFOs:THE ANSWER! 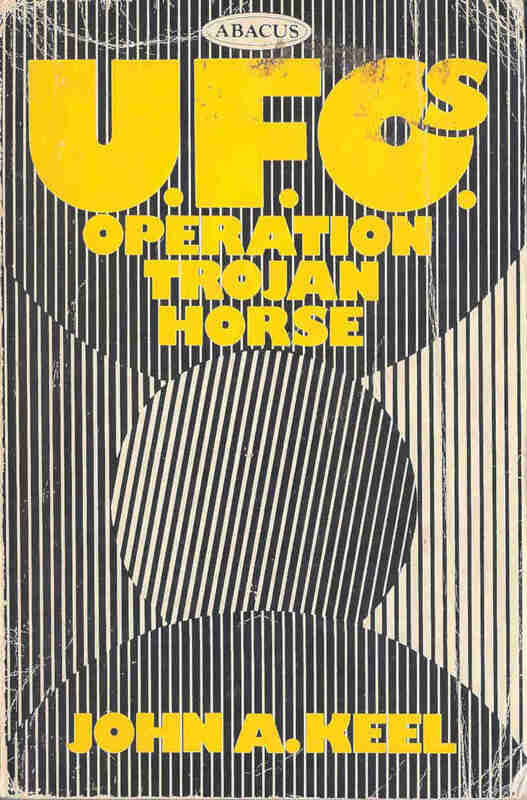 Here are some real gems from John Keel's book UFOs:Operation Trojan Horse. These quotations, taken as a sum, show the true nature of the phenomenon. The Secret War. Title of Chapter 1, p. 13. As soon as I had organized the sightings by dates, the first significant pattern became apparent. This was that sightings tended to collect around specific days of the week. Wednesday had the greatest number of sightings, and these were usually reported between the hours of 8 to 11 P.M. If the UFO phenomenon had a purely psychological basis, then there should be more sightings on Saturday night when more people are out of doors, traveling to and from entertainments, etc. Instead we find that the greatest number of sightings are reported on Wednesday, and then they slowly taper off through the rest of the week. The lowest number occurs on Tuesday. This inexplicable “Wednesday phenomenon” proved very valid and was repeated throughout 1967 and 1968. pp. 19, 20. In my studies of several other flaps I have discovered this same baffling geographical factor. If the UFOs are actually machines of some sort, their pilots seem to be familiar not only with our calendar but also with the political boundaries of our states. They not only concentrate their activities on Wednesday nights, they also carefully explore our states methodically from border to border. Does this sound like the work of Martians or extraterrestrial strangers? Or does it sound like the work of someone who is using our maps and our calendars and may, therefore, know a great deal about us, even though we know little about “them”? pp. 20, 21. Until the fall of 1967, a simple pattern seems to have emerged: Less densely populated areas had a higher ratio of sightings than heavily populated sections. The Air Force discovered this odd fact back in the late 1940's. If this were a purely psychological phenomenon, then there should be more reports in the more densely populated areas. Instead, the reverse has been true. … It is after 10 P.M. that the unidentified flying objects cut loose. When they do happen to be observed on the ground, it is either by accident or design. And usually they take off the moment they have been discovered, or they inexplicably disappear into thin air! Already we can arrive at one disturbing conclusion based upon these basic factors of behavior. If these lights are actually machines operated by intelligent entities, they obviously don't want to be caught. They come in the dead of night, operating in areas where the risks of being observed are slight. They pick the middle of the week for their peak activities, and they confine themselves rather methodically to the political boundaries of specific states at specific times. All of this smacks uneasily of a covert military operation, a secret buildup in remote areas. p. 27. The scope, frequency, and distribution of the sightings make the popular extraterrestrial (interplanetary) hypothesis completely untenable. p. 36. Apparently the U.S. Air Force intelligence teams realized early in the game (1947-49) that it would be logistically impossible for any foreign power, or even any extraterrestrial source, to maintain such a huge force of flying machines in the Western Hemisphere without suffering an accident which would expose the whole operation, or without producing patterns which would reveal their bases. There was never any real question about the reliability of the witnesses. Pilots, top military men, and the whole crews of ships had seen unidentified flying objects during World War II and had submitted excellent technical reports to military intelligence. The real problem remained: What had these people seen? The general behaviour of the objects clearly indicated that they were paraphysical (i.e., not composed of solid matter). They were clocked at incredible speeds within the atmosphere but did not produce sonic booms. They performed impossible maneuvers which defied the laws of inertia. They appeared and disappeared suddenly, like ghosts. p. 36. Sir Victor's remarks are, admittedly even harder to believe than the claims of the various UFO cults. If you are not familiar with the massive, well-documented occult and religious literature, his words may be incomprehensible to you. In essence, he means that the UFO phenomenon is actually a staggering cosmic put-on; a joke perpetrated by invisible entities who have always delighted in frightening, confusing, and misleading the human race. The activities of these entities have been carefully recorded throughout history, and we will be leaning heavily on those historical records in this book. A large part of the available UFO literature is closely linked with mysticism and the metaphysical. It deals with subjects like mental telepathy, automatic writing, and invisible entities, as well as phenomena like poltergeist manifestations and possession. … Many of the UFO reports now being published in the popular press recount alleged incidents that are strikingly similar to demoniac possession and psychic phenomena which has long been known to theologians and parapsychologists. The real UFO story must encompass all of the many manifestations being observed. It is a story of ghosts and phantoms and strange mental abberations; of an invisible world which surrounds us and occasionally engulfs us; of prophets and prophecies, and gods and demons. It is a world of illusion and hallucination where the unreal seems very real, and where reality itself is distorted by strange forces which can seemingly manipulate space, time, and physical matter—forces which are almost entirely beyond our powers of comprehension. p. 46. There are now well-documented cases of people being seriously injured, even killed, by flying saucers. p. 46. Many flying saucers seem to be nothing more than a disguise for some hidden phenomenon. They are like Trojan horses descending into our forests and farmfields, promising salvation and offering us the splendor of some great supercivilization in the sky. p. 47. The World of Illusion. Title of Chapter 3, p. 48. One well-known, heavily documented type of poltergeist (noisy ghost) manifestation produces mysterious fires “Haunted” houses often burn to the ground eventually. Fires of undetermined origin erupt suddenly throughout UFO flap areas. There may be a definite relationship between the numbers of fires and the numbers of UFOs seen in a specific sector. A community suddenly beset with fifteen or twenty major fires within the short span of a week or two seems to produce more UFO sightings in that same period than a place with no fires. p. 58. Although you can't see it, your body is surrounded by self-generated fields of radiation. The occultists have always called this radiation the aura. There have been many people—mediums and sensitives—who have claimed that they could actually see this human aura. p. 58. What has the aura got to do with flying saucers? Perhaps a good deal. Many contactees have been told that they were selected because of their aura. Occultists have long claimed that each person is surrounded by an aura which reveals his spiritual state. p. 59. Still others have claimed that the ufonauts simply walked through the sides of their craft like ghosts. p. 64. The hard (seemingly solid) objects are another problem. Bullets have been fired at them and have ricocheted off. They sometimes leave imprints on the ground where they land. If they are the product of a superior intelligence with an advanced technology, they seem to be suffering from faulty workmanship. Since 1896 there have been hundreds of reports in which lone witnesses have stumbled onto grounded hard objects being repaired by their pilots. In flight, they have an astounding habit of losing pieces of metal. They seem to be ill-made, always falling apart, frequently exploding in midair. There are so many of these incidents that we must wonder if they aren't really deliberate. p. 64. The “secret” of the flying saucers was exposed in 1896, not by the phenomenon itself but by the hidden patterns now revealed in UFO activity of a single week that November. The pattern was a classic of carefully planned confusion and deception. Crews on ships were seeing glowing spheres and saucer-shaped machines rising out of the water and flying away while the Wright brothers were still fussing with gliders. In March and April of 1897, the airship reports began to spread across the country but seemed to concentrate in the Midwest from Texas to Michigan, the same areas which still account for the largest number of reports. Enough of these reports have now been uncovered so that we can safely assume that some of these airships did land and that, at least, bearded men were aboard them. Some researchers point to 1897 as proof that we were being visited by Martians or Venusians at that time. This not only seems unlikely; in view of these stories it seems impossible. No, there has to be another answer to all of this. We can lay out on the map the actual courses of some of these objects and find that they often flew an almost straight line over several towns on a given night until they reached a place where a landing was later reported. Meteorites and swamp gas don't fit into these patterns. But neither do the Martians and Venusians. The operators of the wonderful 1896 airship(s) followed a careful plan which becomes transparent now that we are able to apply hindsight to the huge pile of newspaper reports. (1) It is obvious that a great many unidentified flying objects were present in our skies in 1897. (2) It is obvious that they were manned by at least three different types of beings: (a) the normal types, some with beards and including women, … (b) the Oriental type, the “Japs” as reported by Judge Byrne; (c) the unidentifiable creatures described by Alexander Hamilton. … (4) The occupants of these craft knew a great deal about us, were able to speak and possibly write our languages. Since some—or maybe most—of the ultraterrestrials looked very much like us, they would be assigned to man the decoys. The other objects, the real vehicles to be employed in this operation, would carefully remain aloof. Was there an airship or wasn't there? Thousands saw it and became convinced, but millions read all of these conflicting tales and remained skeptical. Obviously, to the uninformed reader of 1897, there was only one airship and it was experimental—it was always breaking down somewhere. But what were those great, multilighted forms hurtling back and forth across the sky every night? Oh, just the airship. But if there was no secret inventor, and if there's no such thing as unidentified flying objects, then who or what was buzzing Eldora, Iowa, in 1897? And why have they chosen to go back there again and again ever since? pp. 78, 79, 91, 94, 101, 102, 103 [this is mostly a condensed look at Chapter 5: The Grand Deception]. The Wednesday phenomenon is quite evident in the historical events as well as in the contemporary sightings. A disproportionate number of UFO events seem to be concentrated on Wednesdays and Saturdays, particularly the landing and contact cases. The frequency of the Wednesday-Saturday events immediately removes the phenomenon from a framework of chance or coincidence. … Historian Lucius Farish uncovered a number of early statements and cases which further indicated that this Wednesday phenomenon had been observed and reported upon long ago. Concerning “demons”: They lodge in trees, caper bushes, in gardens, vineyards, in ruined and desolate houses, and dirty places. To go alone into such places is dangerous, and the eves of Wednesday and Saturday were considered dangerous times. Unearthly beams of light; sudden automobile failures; disturbing lapses of time and memory; all of these are common-place minor elements in our UFO puzzle. p. 107. Since the witnesses seem to be telling the truth, we must assume that UFOs come in myriad sizes and shapes. Or no real shapes at all. Project Blue Book Report No. 14 tackled this problem. Air Force teams ran 434 “unidentified” reports through a computer, hoping to come up with a basic model. They ended up with 12 very different basic objects. From the thousands of reports compiled since then, it is obvious that there may be 1,200 or 12,000,000 different types. The 12 objects described in Report No. 14 have rarely been seen since 1955. So there may not be any types at all! 1. All the witnesses were mistaken or lying. 2. Some tremendous unknown civilization is exerting an all-out effort to manufacture thousands of different types of UFOs and is sending all of them to our planet. The governments of the world have seized upon variations of the first explanation. The UFO enthusiasts accept the second. I do not accept either one. pp. 142, 143. Our skies have been filled with "Trojan horses" throughout history, and like the original Trojan Horse, they seem to conceal hostile intent. ... This hostility theory is further supported by the fact that the objects choose, most often, to appear in forms which we can readily accept and explain to our own satisfaction—ranging from derigibles to meteors and conventional-appearing airplanes. ... In other words, flying saucers are not at all what we have hoped they were. They are a part of something else. I call that something else Operation Trojan Horse. p. 167. Another fascinating game, which the ufonauts play with a vengeance, is the "repair" gambit. Beginning in 1897, there has been an endless stream of stories and reports, many from police officers, schoolteachers, and other "reliable witnesses," describing how they encountered a grounded UFO and observed the occupants busily making repairs of some kind. ... The basic details in these stories are so similar that it seems as if the ufonauts are following a carefully rehearsed procedure. The "superior technology" of Operation Trojan Horse has apparently produced a line of faulty flying machines which constantly break down. ... If the UFOs were real, it would be logical for a saucer in trouble to seek out a very isolated hilltop to make repairs. Instead, they prefer to land in the fields of occupied farms and on major highways close to big cities. p. 178. The scope of the phenomenon and the overwhelming quantity of reports negates its validity. p. 182. The statistical data which I have extracted, and which I have tried to summarize briefly here, indicate that flying saucers are not stable machines requiring fuel, maintenance, and logistical support. They are, in all probability, transmogrifications of energy and do not exist in the same way that this book exists. They are not permanent constructions of matter. p. 182. The endless messages from the space people would now fill a library, and while the communicators claim to represent some other world, the contents of those messages are identical to the messages long received by mediums and mystics. p. 183. In modern UFO-contactee lore, beginning in the early 1950's, the constellation of Orion is frequently cited as the home of "evil spacemen" who are planning to take over the earth. A famous British contactee, Arthur Bryant, claimed that on April 24, 1965, a UFO occupant informed him that "forces from Epsilon are already here in the form of poltergeists." Epsilon Orionis is the central star in the belt of Orion. p. 190. UFO events seem to occur century after century in the same geographical locations. A majority of these events took place on Wednesdays and Saturdays and were concentrated around the hours of 6 P.M., 8 P.M., and 10 P.M. These facts in themselves are proof that the phenomenon is guided by an intelligence and that the individual events form part of a larger plan. p. 195. No, the real truth lies in another direction. The contactees from 1897 on have been telling us what they were told by the ufonauts. The ufonauts are the liars, not the contactees. And they are lying deliberately as part of the bewildering smokescreen which they have established to cover their real origin, purpose, and motivation. p. 213. The Cosmic Jokers. Title of Chapter 12, p. 215. Demonology is not just another crackpot-ology. ... Thousands of books have been written on the subject, ... The manifestations and occurrences described in this imposing literature are similar, if not entirely identical, to the UFO phenomenon itself. p. 215. The Devil and his demons can, according to the literature, manifest themselves in almost any form and can physically imitate anything from angels to horrifying monsters with glowing eyes. Strange objects and entities materialize and dematerialize in these stories, just as the UFOs and their splendid occupants appear and disappear, walk through walls, and perform other supernatural feats. p. 216. Operation Trojan Horse is merely the same old game in a new, updated guise. The Devil's emissaries of yesteryear have been replaced by the mysterious "men in black." The quasi-angels of Biblical times have become magnificent spacemen. The demons, devils, and false angels were recognized as liars and plunderers by early man. These same imposters now appear as long-haired Venusians. p. 216. If the UFO phenomenon is largely hallucinatory, and much of the evidence suggests that it is, then the parapsychological assumption may be more valid than the ufological speculation. p. 219. The records of demonology are filled with striking parallels. During the outbreak of vampirism in Europe during the Middle Ages, witnesses to vampires were often paralyzed, and the general descriptions of the vampires themselves are identical to the "men in black." p. 219. In the early 1950's, Albert K. Bender dabbled in both black magic and ufology, and he created a stir in ufological circles when he claimed that he had been visited by three men with glowing eyes, dressed in black suits. p. 220. Dabbling with UFOs can be as dangerous as dabbling with black magic. p. 220. Thousands of mediums, psychics, and UFO contactees have been receiving mountains of messages from "Ashtar" in recent years. Mr. Ashtar represents himself as a leader in the great intergalactic councils which hold regular meetings on Jupiter, Venus, Saturn, and many planets unknown to us. But Ashtar is not a new arrival. Variations of this name, such as Ashtaroth, Ashar, Asharoth, etc., appear in demonological literature throughout history, both in the Orient and the Occident. Mr. Ashtar has been around a very long time, posing as assorted gods and demons and now, in the modern phase, as another glorious spaceman. p. 230. The most interesting elemental type is the humanlike being who materializes at seances. ... In a seance room such an entity is automatically regarded to be a spirit—the shade of a long-dead Egyptian. But if the same entity wearing the same metallic skullcap should stride out of the bushes in West Virginia and alarm clandestine lovers in a parked car, he would be considered a spaceman. pp. 232, 233. I cannot even begin to review all of the occult evidence here, but there are dozens of excellent books available covering the whole spectrum of spiritual events. If you take the time and trouble to examine some of the better literature, you will find precise parallels and correlations with the UFO phenomenon. It appears that the same forces are at work in both situations, the same patterns prevail (particularly the hoax patterns), and the same underlying purposes seem to be present. p. 235. Another common factor in poltergeist cases is the sudden materialization or disappearance of physical objects. ... UFO contactees report this same kind of phenomenon shortly after they receive their first visit from the entities. p. 237. It is traditional that haunted houses eventually burn to the ground. UFO witnesses, researchers, and contactees have this same problem, as I pointed out earlier. p. 238. The other is a chart of the recorded poltergeist cases for the same period. We find striking similarities in these patterns. In some cases, the poltergeist wave preceded by a few months or a year or two the UFO activity in the same area. In other cases, the UFO and poltergeist activities occurred simultaneously. p. 239. The trance phenomenon deserves extensive study because so many aspects of it are directly related to the contactee phenomenon. The contactees have been told a hundred different stories of what life is like on other planets. If you review the descriptions of heaven produced at the thousands of possibly genuine seances, you will find the same contradictions. The entities will lie transparently at one point in the seance, and a few moments later will come up with astounding information which could not be based upon simple trickery. The fact that a control can imitate George Bernard Shaw does not necessarily mean that GBS is doing the speaking from the spirit world. pp. 243, 244. Do the ultraterrestrials really care about us? There is much disturbing evidence that they don't. They care only to the extent that we can fulfill our enigmatic use to them. p. 247. From 1848 to 1851 there was a worldwide UFO flap, and poltergeist cases hit an interesting peak in 1849. Strange, isn't it, that all these things should explode at once? p. 251. The following year, 1859, the UFOs were busy again. And the year after that there was another outbreak of poltergeist cases in France and Switzerland. p. 252. It is likely that an outsider trespassing on the scene of a UFO contact would see the contactee standing in a rigid trance, ... p. 271. This is the tiger behind the door of prophecy. Some of the predictions are unnerringly accurate; so precise that there are no factors of coincidence or lucky guesswork. The ultraterrestrials or elementals are able to convince their friends (who sometimes also become victims) that they have complete foreknowledge of all human events. Then, when these people are totally sold, the ultraterrestrials introduce a joker into the deck. p. 278. Comment added by John Keel. Once again the classic, proven pattern had occurred. Another human being had been engulfed by the ultraterrestrials and led down the road to ruin. p. 281. (John comments about a prophecy of a holocaust on December 24, 1967) ... Meanwhile, mediums, telepaths, sensitives, and UFO contactees throughout the world were all reporting identical messages. There was definitely going to be an unprecedented event on December 24, 1967. Ashtar was talking through Ouija boards to people who had never before heard the name. Another busy entity named Orlon was spreading the word. The curious thing about these messages was that they were all phrased in the same manner, no matter what language was being used. They all carried the same warning. p. 282. Many predictions of the December twenty-fourth disaster had been documented well in advance of that date. These messages came through in many different countries, from people who had no knowledge of or communication with one another. The UFO contactees received the same identical messages as the trance mediums communing with spirits. A link had been established. It was now clear (to me anyway) that all of these people were tuned into a central source. My earlier speculations seemed true—the UFO entities and the spirit entities were part of the same gigantic system. ... Some of the entities were evil liars. p. 283. Comment added by John Keel. (John comments about a contactee) ... In later experiences, he allegedly visited various planets such as Venus, and he frequently received telepathic messages and instructions from our old friend Ashtar. p. 284. You Can't Tell the Players Without a Scorecard. Title of Chapter 15, p. 291. The flying saucers do not come from some Buck Rogers-type civilization on some distant planet. They are our next-door neighbors, part of another space-time continuum where life, matter, and energy are radically different from ours. Ancient man knew this and recognized it. The original Biblical texts employed the word sheol, which meant invisible world. Somehow the translators turned this into "hell" and gave it an entirely different meaning. p. 291. The real truth is that the UFO cultists have been played for suckers for years, not by the government, but by the phenomenon. p. 294. The demonological events discussed in this book have so baffled and confused the UFO organizations that they have dismissed most of them as hoaxes without any kind of investigation. p. 295. It is probable that some small group within the U.S. government first began to suspect the truth about UFOs during World War II. There is curious evidence that Adolf Hitler and his inner circle had some knowledge of the ultraterrestrials and may have even made an effort to communicate with them. p. 296. Sir Victor Goddard pointed out that he believed that most UFO sightings were made by people with psychic ability, and by nonpsychics who were standing in the auras of the real percipients and were, therefore, temporarily tuned in. p. 298. In psychic phenomena and demonology we find that seemingly solid physical objects are materialized and dematerialized or apported. p. 298. The thousands of contacts with the entities indicate that they are liars and put-on artists. p. 299. The UFO manifestations seem to be, by and large, merely minor variations of the age-old demonological phenomenon. p. 299. Finally, we come to the problem: How do you investigate something that doesn't exist? p. 301. The elementals or ultraterrestrials are somehow able to manipulate the electrical circuits of the human mind. They can make us see whatever they want us to see and remember only what they want us to remember. p. 302. There are now many cases in which the voices of deceased persons have seemingly called up their loved ones on the telephone, just as the metallic-voiced space people have been phoning researchers and reporters around the world. p. 306. The Bible warns us that during "the last days" this planet will be overrun with wonders in the sky and false prophets and performers of miracles. Could anyone else have said it any better? John A. Keel, OPERATION TROJAN HORSE: An exhaustive study of unidentified flying objects - revealing their source and the forces that control them,* 1973, Abacus. The O and s have the s superimposed over the O to the top and the right and above the period. This is my original paperback copy I purchased back in the 1970s before I became a Christian. Background image courtesy: NASA/ESA/UCSC/Leiden Univ. Last revised: 27 Jun 2014. —a puzzling review Why is this movie anti-religion and pro-Evolution? Actual UFO communications do not support the sentiments promulgated in this movie!